Ronald Walken (born March 31, 1943), simply known as Christopher Walken, is an American movie, television, and theatre actor. He is best known for playing evil or mentally damaged characters. He has sometimes used that image for comedic effect. He was born in Queens, New York to a German father and Scottish-born mother. Walken has been married to casting director Georgianne Walken since 1969. 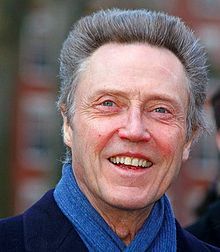 Walken is a skilled dancer who in many of his movies dances, because he requests it. He has been in nearly one hundred movies and television shows since 1953, including The Dead Zone (1983), Brainstorm (1983), A View to a Kill (1985), Batman Returns (1992) True Romance (1993), Pulp Fiction (1994), Nick of Time (1995), Mousehunt, (1997), Catch Me If You Can (2002), Around the Bend (2004) and The Jungle Book (2016). He was George Lucas' second choice for Han Solo after Harrison Ford. He won the Academy Award for Best Supporting Actor in The Deer Hunter (1978) where he played a disturbed Vietnam veteran with Robert De Niro. He was nominated again in 2002 for Catch Me if You Can.